Yes, you read that right. I was individually sued by my former company for 10 million dollars. I'm writing this post April 1st, 2016, well after the lawsuit has ended and has left our lives and minds. But it did ruin the latter half of the summer land all Fall. The lawsuit was officially over in mid-October and after ceremoniously burning my copy of the deposition against us at a party at Eric’s when we found out, and waiting months for a buffer it’s time for me to tell the story - from my point of view... This is my personal family blog which also serves as my public life diary. Everything I say within this post came out in court or in public court documents. It is all my point of view and I’m exercising my right to free speech in writing this. Besides, nothing I write hear could possibly hurt QSI more than how QSI has already hurt themselves by bringing the lawsuit against us in the first place. Read on.. When I joined the Corvallis office of Watershed Sciences in February 2008 I was incredibly excited and grateful for the opportunity. At that time Watershed was the premiere source of remote sensing data in the Pacific Northwest and everyone knew it. Sometimes we took a little bit longer than expected to deliver the data but when we did we crushed it and all our clients were super happy with us. We also did A LOT of scientific work for universities, research groups, etc. It was hard work, challenging, and I was proud of what I was doing. Well, as predicted I hit it off with Matt and was absolutely blown away by how smart he was and was enthralled by his vision of the future for the company. It was a bigger office and because they had bigger deals with Oil and Gas companies the office in brought in more money and appeared more successful. Unfortunately, I would learn later that bigger deals and more money aren't always the best signal of "success". I switched my line of work from working with LiDAR to working with Aerial Imagery as I love photography and am a semi-professional photographer on the side with my own brand and website. I became the #2 to my boss Arley who ran the photo department. We worked great together and became close friends as I did with several others in the office, some whom I helped hire and train who then went on to huge promotions in the company. In the fall of 2013 the owners of Watershed Sciences decided that a merger with two other prominent remote sensing firms was in the best interests for the future of the company. At the time the owners and management sold it to the employees as a wonderful choice and honestly, most of us believed it. We were told there would be more money for newer sensors, more R&D time and that we would be able to continue growing rapidly to dominate the market. We were also promised that we could continue working on "green projects" those that benefited science and green energy and conservation. We were also told that we "would never outsource data to be processed poorly in foreign countries". The company was re-branded from Watershed to WSI and then after the merger to Quantum Spatial or "QSI" for short. After the merger there was a lot of confusion in management on how to merge 3 very different companies who very differently from each other. One company would still be drawing flightplans on maps and digitizing vectors with giant pads and pens while another would be using cutting edge software to do it many times faster. This isn't even mentioning the fundamental culture clashes between us all. And yet, I still understood... mergers are sloppy and it would take time to sort it all out. Unfortunately, the realities of "sorting it out" proved to be too much for most. We were now owned by a capital venture firm who only cared about numbers which meant a huge shift away from smaller projects to huge oil and gas and electric jobs that brought in more money. This led to the first wave of employees leaving, those who didn't want to work for a company that supported "the man" or "big oil and gas" etc... I strive to live a very "green" life but being married to Emily I also understand that you need to make money as a business so I accepted the change. Then the leadership team began hiring executives to run the company that either lacked experience or had no background or understanding of our industry at all. This was the first warning sign for us... After these hires the promises made to us at the time of the merger began to be broken. Data was approved to be processed oversees, benefits were drastically cut, health insurance skyrocketed, etc etc... I was lucky enough to be given a management position when my boss Arley was promoted to a role she was frankly scared to take on. My new position, like many others given out was given to me without any talk of a pay raise which thankfully came to me nearly a month later... others who were "promoted" weren't so lucky. I will admit that I lucked out in early 2015 but it wasn't for a lack of effort. In 2014 I had crushed several projects on my own saving the company hundreds of thousands of dollars in processing costs, working regular 60+ hour weeks and even sleeping in the office at times. I had also studied hard and achieved three well-recognized certifications in my industry. I had earned my promotion. When I refer to luck I mean that I was lucky enough to travel for software training just before a complete travel ban, and I was lucky enough to be promoted before all upward mobility in the company came to a screeching halt. Throughout this time there were martyr's.. those who were brave enough to speak up only to be told "deal with it" in one way or another. The portland office began to lose talent rapidly. Many of the skilled employees who had been their from the start as well as the shining stars who had come on board began to look for other jobs and leave. I also began talking with my fellow co-workers about exit strategies as I was no longer proud of the work we were being rushed to complete. Quantity became more important than quality which was the fundamental mentality shift that ended up being the one of the last straws for me. I'll get to the final straw soon, promise. The talks were about leaving and possibly forming our own remote sensing company on the side. One where we might even partner with QSI to help them out on their work loads. We had no ill-intentions, we just wanted to leave and have more freedom to ensure the quality work we remembered. This was about the same time I got promoted so I was definitely on the fence about whether to ride the storm out or catch a ride on a life boat with everyone else who was jumping ship. Then the final straw hit. And when I say final straw, it was about a person I worked with. No names but I will say that over the time she joined the photo group to when I left she progressed from a newbie to one of the most talented and dedicated employees I knew there, yet she was getting paid garbage. So little that she was having trouble supporting her family. I relied on her immensely in my day to day work so I went to bat for her to get her a raise. I won't go into details but it took 3 months. Well over a dozen emails, several phone calls, bulleted lists of why she deserved it, etc etc. I asked Emily for advice on how to properly request this and I followed all her advice and was getting nowhere with anybody in management. Then I went over all their heads directly to a senior board member... and it got done the next week. Because of my actions I was "professionally counseled" by my boss and another and it felt very much like a slap on the wrist. In my mind, I had prevented an incredibly talented employee from leaving the company. There was work going on that would have cost the company 5x her salary if she had left with everyone else, yet I got reprimanded. At that moment I knew everything had changed. All the perks and benefits of working for Watershed Sciences were now stripped of us, we were overworked, underpaid and forced to deliver crappy data because of completely unreasonable deadlines. Clients began to leave us or reject data left and right and our reputation in the industry began to plunge. Apparently we hadn't reached the "too big to fail" phase that I think the CEO assumed we were at. All that combined with disparaging remarks I heard from Matt towards the employees that helped build Watershed from the start was my breaking point. The crazy part of it was that those remarks were told to me as he was giving me my promotion which made it even clearer that if you weren't in "his circle of trust" you were meaningless to him. Around that same time I and my co-workers who were planning on leaving to start our own thing got introduced to a employee of Cardno through a mutual acquaintance and we began talking about the possible option of opening a remote sensing office for Cardno, an Australian company. Let me be clear here - there was no recruitment.. no evil plan, no sinister desire to hurt QSI. It was a situation like this "hey I hear from so and so that you all are thinking of leaving QSI... we'd love to start a remote sensing group if you are interested" and us thinking... hmm, let's think about it and we'll get back to you... That was the situation. Initially, the group of us leaving was much, much larger and the choice was a hard one for some of us. It wasn't until my last straw that I decided to leave for sure, and that was just a couple months before we actually left. Many had made up their minds to leave far before me. For others it was too much of a risk financially to leave something they considered pretty stable. I definitely did not consider QSI to be stable... We all submitted our applications for Cardno in early July and were waiting anxiously on approval from Cardno to take on our group and fund us. When that approval came and we were accepted we decided to turn in our resignations. Throughout this entire waiting period we were all preparing our teams as much as we could for our departures. Nearly all of us were division leads in the office and combined managed the full the range of processing groups. We were important leaders and we wanted to ensure our teams could function in our absence. I was super confident in the leadership skills of the employee that I finally got that raise for so I wasn't too worried about my group. And due to a big project win the office was also rapidly hiring people finally so we all felt it was as good of a time as any to leave. After a very heated managers meeting on Friday July 10th, where I called out Matt openly for some comments he had made I was pulled aside by Cindy, the head of HR. Admittedly, it was not professional what I had done, and I regret saying what I did. She was right, and I had lost my cool because even up to that moment in time I was fighting to get the point across to management that things needed to change and I was looking out for my co-workers whom we were leaving. But, here’s the best part of the story…. in that same meeting where I was being coached about professionalism, Cindy’s phone rang and she picked it up without asking me if it was ok. We were in a private meeting room and her taking a phone call mid-sentence with me seemed a little contrary to the “professionalism” she was coaching me about. And to top it off, the phone call was about a very successful side business that she was running that involved feminine hygiene products for teenage girls. After the phone call there was some pretty awkward conversation between the two of us about tampons, the “KY Jelly Guy”, etc… The whole situation was weird… but what I came away with was that the Head of HR for Quantum, the woman who was supposed to right the sinking ship, regain employee confidence and attitudes, and create incentives to stay, was so busy with a side business that she found it totally ok to interrupt a meeting with me to discuss it while on the clock working for QSI. When I asked her how she planned to allocate the massive time needed to correct the current problems at QSI while running a side business she essentially shrugged it off saying she would hire someone for her side business to run it… but clearly, it was still taking up her time while at QSI. So… it was then that I first hinted at leaving on Monday and she suggested I take the weekend to think about it. On Monday I called my boss and gave him my 2 weeks notice over the phone. When asked where I was going I didn’t feel like anyone needed to know. Just that I was tired of all the broken promises and no raise that QSI would offer me would be enough to stay. I then talked to my team about it, the same day that two new employees joined us.. so that was awkward. Speaking of those two new employees, they were post-graduates from across the country, that I had spent weeks actively recruiting for their talent. They weren’t hires off the street.. they were highly skilled which shows that even up to the end I was looking out for the best interests of the company I was leaving. Layne and Josh had given their notice on Friday I believe, but it’s been so long it could have been Monday as well. Well, with three important people leaving flags started to go up… to be honest it was such a crazy two days that I can’t remember clearly now how it all went down. Somehow it got let out that Tom and Eric were also leaving and people from the Corvallis office as well. Rumors started to fly that it was a group as big as 30 people! Matt was running around the office freaking out and an emergency SLT meeting was called to discuss what was happening. Needless to say, Monday rocked the company and by Tuesday it was full on panic within management, especially with a big project coming up. Well, I guess management didn't like me talking to him, because the next day on what seemed like the most chaotic day in company history, I was told at 4:30pm to clean out my desk and leave. An "all hands on deck" meeting was called for 4:45 and I had about 10 minutes to clean out everything and leave with an HR woman watching my every move. Thankfully, I had been wise enough to take home most of my personal things the week before. But I still had a lot. Usually when people left there was a happy hour gathering and they got clapped out of the office. Instead of claps, I was met with completely shocked faces, especially from the guy I had just hired last week who was sitting behind me. I'm sure he and all the other new hires had their confidence rocked that week watching a large portion of the leadership depart. Apparently Layne was told not to come back to the office and Josh was also escorted out, minutes before I was. At that point 3 of us had left and we were all confident that our friends would follow in the coming weeks. On Wednesday I slept in with Leo at my side and enjoyed sitting in the backyard in the sun as I my phone shook all day long with text messages telling me all that was going on. Apparently, at the meeting after I left and at subsequent meetings Rajib, the CEO and others in upper management began calling our departure a "hostile takeover". Thus began the management smear campaign against us. Even though all of us were very clear that we were simply moving on for better pay and to be happier in our careers they attacked our work ethic and our personalities. Eric and Tom were actually in management meetings where they discussed the hostile takeover! I can't imagine how awkward that must have been. Tom and Eric had also by then told management they were leaving but wanted 2-4 more weeks to prepare their teams and teach the new hires and asked that they be given the right to talk to their teams first before announcing their departures. Well, management and HR chose to ignore all that and leaked the information to the floor forcing Tom to hold an emergency meeting with everyone on his team. Yes, we should have staggered our departures over weeks to avoid all this but management could have handled it much more professionally. For the next week rumors flew around the company. Our friends who didn't know our plans I'm sure felt confused and some felt betrayed asking "why weren't we involved, or thanks for the invite..". When Eric told Matt, who used to be a very close friend, that he was leaving, even Matt, the previous owner and SLT member said "I wish I was going with you". He also broke into Layne's exit interview to ask who else she was "taking with her". Well, his attitude definitely took a shift from jealousy to anger the following week as he mentioned to one of us... "I see what this is... a power play". We also learned that our workstations had been confiscated. 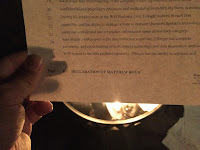 When I was walked out I was given a piece of paper to sign that was in essence a backdoor non-compete form. It basically said, "In exchange for final payment, Mr. Ellinger agrees to not use anything he learned while working at QSI in future employment". When I read this I consulted with my friends, Emily and all of us consulted with a Lawyer who strongly urged us not to sign it. The best part of it was that halfway through my document "Mr. Ellinger" changed to "Ms. Romano" which showed HR just copied and pasted my name into someone elses illegal backdoor non-compete form. Emily, trained in HR also clearly pointed out how illegal the document was. An employer can't withhold payment forcing someone into this! As it was I was told I would get my final payout but it took until Friday the week I was walked out and a phone call from me pointing out that it was illegal for them not to pay me within a day of being escorted out, that I finally had a wire transfer made to my account (costing me a fee as well). Oh and I contacted Annalisa (Romano) to ask if she signed the paper which she definitely hadn't. The following Friday (27th) we all got calls or messages from QSI lawyers saying there was a restraining order being filed against us. We didn't think too much of it and assumed it meant preventing us from going back to the office and when it wasn't made clear to us that we could represent ourselves at the hearing on Monday QSI pulled a fast one on us and obtained the order easily. To this day I strongly believe that if we had been fully aware of the importance of us being at that hearing with the judge we could have explained to her our intentions and that order probably never would have been granted. I had a get together at our house that weekend with a bunch of people for my birthday which had been on the 22nd, the week after I left. Our group as well as some QSI employees attended. It was a good time among friends and everyone wished us well in our new venture. Some even mentioned they were jealous of us finding such a great exit. Non of us gave much thought to the lawyer phone calls we assumed were to prevent us from going back to the office. Well, on Monday we all got served papers and although I didn't notice it at first Conrad pointed out to me that at the top of the paperwork it said that I personally was being sued for 1 to 10 million dollars. Shock... sick to my stomach... scared. The restraining order barred us from working for Cardno and from working in our industry. Our prior company was attacking us personally, accusing us of corporate espionage for Cardno and stealing all of their intellectual property, what Matt called their "Special Sauce". He had written a 99 page deposition against us and filed it with the Oregon Court system saying that we knew all of the secrets of their processing and without us the company was in serious harm. Really, a 500 person company loses 7 people (Layne, Josh, Doug, Tom, Eric, Conrad, and I) they act like the company is going to die??? I wish I could use his deposition in my resume as it makes me out to be a superhero of image processing! The deposition also contained other interesting facts... According to the QSI forensic "expert" they hired Conrad and Josh had used a sophisticated method of wiping their hard drives clean. I'm not a forensics guy and even I know that SSD drives use a method called "TRIM" to clean out free space which apparently confused this "expert" of theirs. In later documents QSI retracted that claim saying it was a "mistake". The document also demanded that we all be able to account for every drive that ever touched our workstations for the last 6 months! What! In that office on a typical day we were plugging and unplugging a whole myriad of work drives... there was no way we could do such an accounting and anyone who worked there knew it. Did they even review this lawsuit before giving it to us? It was riddled with false claims and craziness. I keep a copy to this day just to get a laugh from it all. Not only did we get served papers, but Doug was still in the Corvallis office working hard for the company that was then serving him lawsuit papers. Doug was the last one still at QSI as Conrad, Tom and Eric had all walked out as soon as they received calls from Lawyers the week before stating that between the calls and the meetings where they were accused of a corporate takeover they didn't feel it was a safe work environment for them anymore. But Doug, with his dedicated attitude was still trying to do his best to leave professionally and yet he still was sued... Assholes. We all got some food together at the Breakside Brewery to discuss what was happening. We were all terrified. Non of us had experienced this before. We didn't understand why QSI was suing us personally. Non of us had that kind of money. Thankfully, our amazing new company Cardno sprung to action and hired some of the best lawyers around, Amy and Ed from Stoel Rives. They emailed us and called us all together for a meeting on the 29th to meet us and start to prepare our defense. A meeting that lasted 6 full hours. From that meeting we learned that QSI was accusing us of stealing clients as well as intellectual property. We definitely were doing neither. In mid June, a month before I gave my notice I had downloaded a bunch of the training manuals I had written for freely available 3rd party software as well as a bunch of matrices I used to measure workflow and other docs that I had participated in developing while working there. Having never been given any IP training I didn't believe anything I downloaded to my personal machine was proprietary to QSI. What I understood IP to be was, for example, unique code or macros written by QSI employees for processing. I knew these existed and I didn't take or even look at any of that stuff. From movies and books I knew that stuff was definitely off-limits. The week after I was walked out and before we got served papers Layne and Josh were strongly told by QSI to return any and all QSI drives and documents they may have. This freaked me out as well so I deleted everything I had downloaded, except for my personal resume and my study notes for my certification exams. I also went through my email and deleted anything I could find QSI related because I had my work and personal account linked for convenience while working there (what a dumb idea...). So, by the time we met with Amy and Ed I was pretty confident that I had deleted everything QSI related from my life. Super disappointing because I still think QSI could never claim IP on most of it as it evolved around 3rd party software.... oh well. It was all in my head anyway. Amy reassured us that in most cases like this it there isn't an actual award of money which made us feel better. She also recognized how scared we were and that we had done our best to rid ourselves of any QSI related stuff. Basically, it was crystal clear we hadn't done anything illegal, and QSI didn't have a leg to stand on. The following weeks were horrible. We were directed not to be in contact with each other, nor any of our friends from QSI. Eventually, these restrictions relaxed to just preventing us from talking about the lawsuit and I was able to visit my friends in Corvallis, who also told me they were thoroughly questioned about us leaving. Our lawyers directed us to turn in all of our electronics for forensic searching. This was incredibly intrusive as copies were made of all of our family media and it took weeks for me to get some of my stuff back. When I did get my laptop back I realized that my chrome browser history contained all the documents I had downloaded while still an employee in June. I freaked out and called our lawyers who then asked the group basically if they trusted me and whether to stick with me as a group or tell me to fight the lawsuit on my own. That night, was and I'm sure will remain, the lowest point of my life. 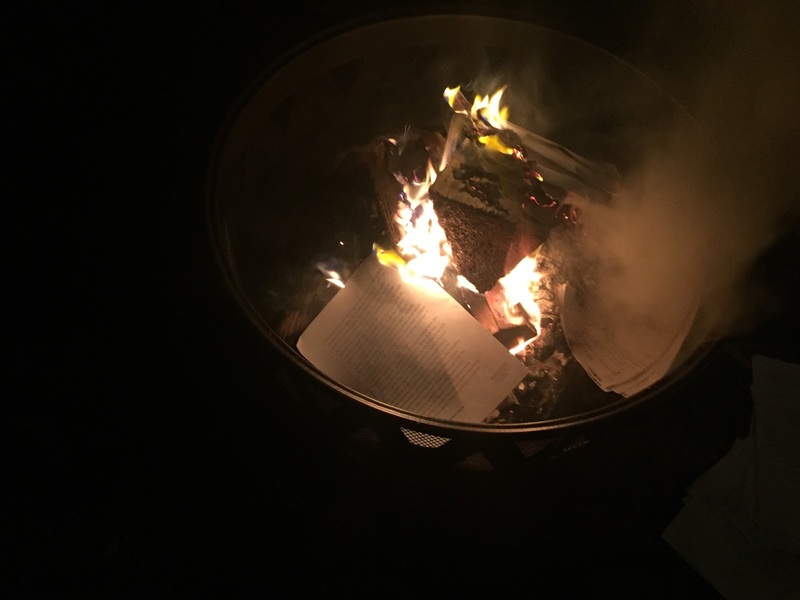 I knew I had done nothing illegal, and that all of the documents had long been deleted, but the appearance of my actions looked terrible for the lawsuit and I had to my fate in the hands of my friends. That night and the next morning I got personal calls from each of my future co-workers giving me their love and trust and we continued forward as a group. At that point I knew that if we could, as friends and as a team, make it through this lawsuit we could accomplish wonderful things! The other part of the deposition against me was by Marc, the head of IT in the Portland QSI office. He had accused me of uploading over 500gb of data to the internet via the office wi-fi connection. When this came out in the lawsuit Amy and Ed were clearly shocked and worried but I laughed out loud.... why you ask?? Well, if you know me you know that I am religious about backing up my family media like photos and movies to multiple locations. Just before we all left QSI Google released a new product called Google Photos which provided free online unlimited storage of photos and videos! This was awesome to me and I immediately began to upload photos and videos from home. But since I have over 100,000 images and thousands of videos and at that point had a crappy Comcast connection it was super slow so I brought my laptop to work and uploaded from there. Unfortunately, my personal media external drives are the same model QSI used to pass data around so it clearly looked like I had one of their drives and was uploading what they assumed was project data to a "secret Cardno server or something". They couldn't have been more wrong.. which is why I laughed and the computer forensics firm Cardno hired easily proved that everything I uploaded from work was simply family photos and videos to google for personal backup. Hence I hold no ill-will towards Marc. Like the documents I had downloaded in June, what looked really bad to the outside eye was just my personality and nothing that could hurt QSI. So, I was definitely expecting to be singled out by the QSI lawyers at the hearing we had to modify the restraining order. Our whole group got dressed up and appeared in court behind Ed who had been practicing hard for the hearing. Amy, his boss, and partner in the firm, stayed in the back. We expected to see Matt there but instead Marc and Tim (HR) showed up with the QSI lawyers. As I expected they singled my downloads out but their theories on what we did were so completely wrong that for a brief moment my absolute fear was almost lifted into a chuckle. Their lawyers were trying to prove that Josh was trying to design a server system for our new team based off of QSI's and that the documents I downloaded were for him to undercut QSI on their software pricing!!! Ironically, some emails that Josh had sent out asking us about our server needs for our new venture happened to be around the same time I downloaded the documents but neither were related in any way. Our lawyers had provided a clear list of what I had downloaded to their lawyers and they chose to focus on "item #12" which was a harmless price quote for a piece of $100 software anyone could get with a simple email... although this was never shown to the judge... Hell, I would have handed them a crisp $100 and laughed about it if it would have made the lawsuit disappear then. In between their silly powerpoint slide show they kept flashing a screenshot of my Facebook page as well in which I posted an image the day we got served paper an image of a card that said, "nothing says it's over like a restraining order". I was so focused on what they were accusing Josh and I of that I didn't even realize they were flashing that between slides. What idiots. It was also extremely obvious in the courtroom that claiming the knowledge and skills of 3rd party software in our heads was QSI proprietary "special sauce" was absolute nonsense. That would similar to trying to prevent an accountant from switching jobs because they learned excel at their first job or a graphic designer to move because they learned the Adobe suite. It turns out the judge wasn't too happy with their antics, nor the fact that is was blatantly apparent that QSI had pulled a fast one on her by giving us almost no notice and then getting her to sign the restraining order against us thereby putting half of us out of work and pay for so long. I was on-boarded with Cardno just days before the lawsuit and was getting paid but Eric, Tom, Conrad, and Doug were not. After over an hour in the courtroom it ended and we walked out pretty confused with the results. Amy told us all to hug each other as it was a big win. Ed had done a fantastic job and the judge had demanded that all of us be able to be onboarded with Cardno and start limited work until both companies could agree upon which markets we could obtain work from without stepping on each other's toes. This proved to be the turning point of the lawsuit for us being scared to us being angry for QSI setting our progress back so much. Clearly they had achieved their goal of thoroughly disrupting us but they didn't achieve their goal of trying to put us all out of work. The lawsuit continued onward towards a scheduled trial in November while we all got to work out of our home. Emily and I had plenty of space and Leo became the office mascot. We were afforded more freedom to leave our houses and talk with friends instead of having to wait around for phones calls and faxing documents... We were able to dive into work and research while Amy and Ed worked out with the QSI lawyers what we could bid on for work. We all began to build a case against QSI as well. We had the illegal back-door non-compete forms that could start a class action lawsuit as there were tons of former employees (we made a list) whom had left who we were sure were given the same forms. Many of the employees that left before us also had far more intimate knowledge of the company and some were programmers whom I'm sure took their code with them.... but they weren't individually sued. I'm not going to go into more here but we had a ton of dirt on inappropriate actions of QSI as well we were ready to bring up should they decide to go forward with a dirty trial against us. There was another hearing a month later where once again we won a slam dunk and rumor has it that Matt was in the room and stormed out in anger after.... which made us all smile. Then came the kicker... the call from our lawyers that QSI had an offer on the table to settle. The offer was that Eric, Tom and Doug could remain with Cardno but Jon, Layne, Josh, and Conrad had to be fired. Our Cardno representatives didn't even look at the offer. Hell no they said. Shortly after we declined that offer QSI formally exited the lawsuit preventing it from going to a costly trial that they clearly would have lost. The ended it without prejudice though which means that they could re-start it if they felt it was warranted. This was about a week before Halloween and it was definitely a cause for celebration. We were now able to explore all markets although we were of course advised to tread lightly near any QSI territory. This was fine for us as we knew QSI was quickly gaining a horrible reputation in the industry and that clients would soon come to us anyway. This became very apparent to me when Conrad and I attended the Reno UAV conference. On Halloween Emily and I went down to Corvallis for a party at Danielle and Scotts. 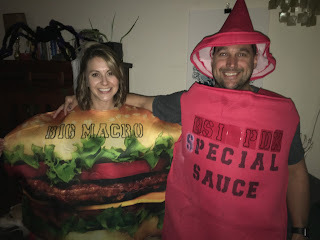 We were having a hard time with last minute costume shopping but when I saw a burger costume and ketchup bottle I new exactly what we would be.... A Big Macro and "Special Sauce". Turns out not everybody at the party got the joke, but those that did found it hilarious. I posted a photo of the two of us on Facebook and tagged Matt to the post, quickly explaining that he had led a lawsuit against each of us personally for 10 million dollars and it was because of that that I had become a ghost socially for half the summer and the entire fall up to that point. I knew this post would receive a ton of comments from current and former QSI employees and it certainly did with a lot of likes as well. I purposely kept Matt as a "friend" throughout the entire lawsuit because I knew at some point I could find a way via social media to show him that he wasn't as loved and respected as he thought he was. He is so high and removed in the company that he has completely lost base with all the employees who got him to where he is. He showed me before I left that he has little respect for most of his employees so I wanted to show him that it was mutual and take him a peg down off his high horse. Because he was tagged on the post he got to see the comments from all those who work around him, comments and likes from people that he trashed talked myself and my colleagues too. Some of my best friends in life, my groomsmen, had been to the Portland office and Matt had openly trashed me in conversation with them not knowing how close we are. Well, the Monday after Halloween we heard through various channels and friends still at QSI that Matt had called an emergency SLT meeting once again, but this time to ask the QSI lawyers if he could sue me for slander based on my halloween postings. He was told no. Of course he couldn't. This is America and it's called the 1st Amendment. Hearing this news made me laugh. Clearly I'd gotten my point across. Time to pull a George Costanza and leave on a high note. This was my Magnum Opus. In a followup comment on my own post I had made it clear that I was done. Done with the lawsuit and done with QSI. No more comments on social media, going out on a high note. And with that thought I deleted the Facebook Post and unfriended Matt. If you have made it to this post and made it all the way to the end, then good for you. I write this in April 2016, months after the lawsuit has been long dead. Everything I've written here came out in court and was told to the QSI lawyers. Nothing is fabricated. I've told the truth about my actions throughout the ordeal. Everything is my opinion on how it went down from my perspective and in this blog so that I never forget what I went through. My observations and the rumors I heard and still hear about QSI are just that, observations and rumors. But, when you hear enough of the same "rumor" from enough people, especially current employees you can assume there is a grain of truth behind it. From day one of the lawsuit, everyone, us and our QSI friends said that it would end up hurting them far more than us. Perhaps the newest employees hired just days before we left were swayed by the smear campaign but anyone who had worked with us and knew us understood what was happening and were disgusted by it. Russ, the other owner of Watershed was asked to participate in the lawsuit against us and he flat out refused saying, "you know them, they wouldn't do this". Respect for my former Corvallis boss for trusting in our ethics. Our departure wasn't the first. There were waves of office closures before us and scores of veteran employees from all offices were leaving for other jobs. Nor was our departure the last as other leads in the Portland office soon found their own exit strategy. The Portland office, once revered as a "center of excellence" quickly became an example of what not to do and I've been told that when the CEO, who once threatened to close the Corvallis, visited there after we left he told them that if he had to be the company on one office it would be Corvallis. Way to go friends down south! For the last few months we've watched our friends who still work at QSI take hit after hit. We heard that on Christmas morning of all times, the CEO sent an email out to everyone saying that their 401K would not be matched by the company. Many who worked long hours expecting promised bonuses were denied those bonuses. Perhaps the company spent too much money on a needless lawsuit?? We've seen more massive layoffs. The SLT member whom I went above my boss to get the raise for my team member has left. My counterpart in Imagery in the Lexington Office quit around the same time I did. Several very talented people now work at Apple. And most recently, the head of HR, whom I've heard help spearhead the lawsuit against us and who coached me on professionalism while taking a call about her teenage tampon company was just fired. Employees are still expected to meet ridiculous deadlines but it seems like less and less of them are willing to kill themselves for a company that doesn't give them any incentive to do so . QSI continues to be a sinking ship, one that I'm happy to no longer be a crew member on. We were all welcomed with open arms into the Cardno Family and we aren't looking back.